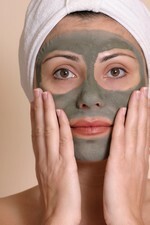 An exciting 2003 green tea and skin study reveals how tea extract may one day revolutionise skin care products. Dr. Stephen Hsu, a cell biologist in the Medical College of Georgia Department of Oral Biology, has uncovered a wealth of information about green tea and skin cells in the last few years. He recently began studying the most abundant green tea polyphenol, EGCG. Using pooled human keratinocytes (skin cells), he and his colleagues studied the normal growth of the skin cells and compared it to the growth of the cells when exposed to EGCG. To their astonishment, they found that EGCG reactivated dying skin cells. The skin consists of three layers: the epidermis (outer layer), dermis (mid-layer) and hypodermis (inner layer). Dr. Hsu learned that green tea polyphenols aren’t absorbed beyond the epidermis, so any benefits are limited to that outer layer of skin. But the benefits, he stressed, seem significant. Cells in the epidermis, or keratinocytes, are in a constant state of renewal. The newly formed cells, stem cells, are undifferentiated but rapidly dividing. As they push through the epidermis, they begin differentiating. During this migration and differentiation process, the cells are very active, expending and consuming vast amounts of energy. Once they reach the surface of the skin, their metabolic activity slows dramatically and they prepare to die, while forming a water-proof, sheet-like structure. As they die off about a month into their life cycle, they are replaced by another wave of migrating cells supplied by stem cells, starting the process all over again. But EGCG seems to be a fountain of youth for skin cells. “When exposed to EGCG, the old cells found in the upper layers of the epidermis appear to start dividing again,” Dr. Hsu said. Combining these effects of EGCG on skin cells in different layers of the epidermis, Dr. Hsu noted potential benefits for skin conditions as diverse as aphthous ulcers, psoriasis, rosascea, wrinkles and wounds. “If skin cells surrounding wounds or infections don’t heal in time, fibroblasts in the connective tissue may rush in to fill the void and cause scar tissue formation,” he said. This potential green tea and skin benefit is particularly exciting for conditions such as diabetes, which stubbornly inhibits the wound-healing process, Dr. Hsu said. This green tea and skin study was published in the Journal of Pharmacology And Experimental Therapeutics. Green Tea Polyphenols Induce Differentiation and Proliferation in Epidermal Keratinocytes (2003). Stephen Hsu, Wendy B. Bollag, Jill Lewis, Qin Huang, Baldev Singh, Mohamed Sharawy, Tetsuya Yamamoto, and George Schuster. Journal of Pharmacology And Experimental Therapeutics. First published on March 27, 2003; DOI: 10.1124/jpet.103.049734.